I mentioned in another post that I sometimes cook porridge while riding the bike, to have a hot and filling breakfast when I get somewhere. On the off chance that someone is wondering, here is what I do. There really is nothing to it. Put 150g of rolled oats into a yoghurt maker by filling it to just over the 350ml mark on the side of the canister (I eat a lot of porridge). Add pinch of salt, brown sugar or other condiments to taste, and then fill the yoghurt maker right up with boiling water. Quickly screw the lid on before the container gets uncomfortably hot to grip tightly. Now insert it into the insulating jacket. Since the hot water in the porridge is providing the heat, you don't add any water into the jacket. You might like to come up with some solution to keep the jacket closed, since they were never designed to stay on in a bike. When I used to do this with my mountain bike I just stuck it upright in my panniers, and all was well. But with the bakfiets, the jacket can fall over and roll around and undo itself, possibly spreading porridge on your stuff, so I would wrap it in a towel, or tape it shut or something unless you keep your bak full enough to keep the jacket upright. 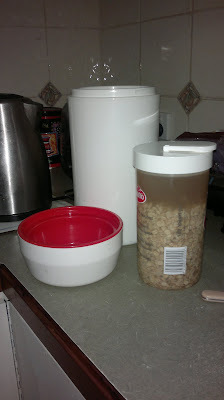 150g of oats porridging in a 1kg yoghurt maker. 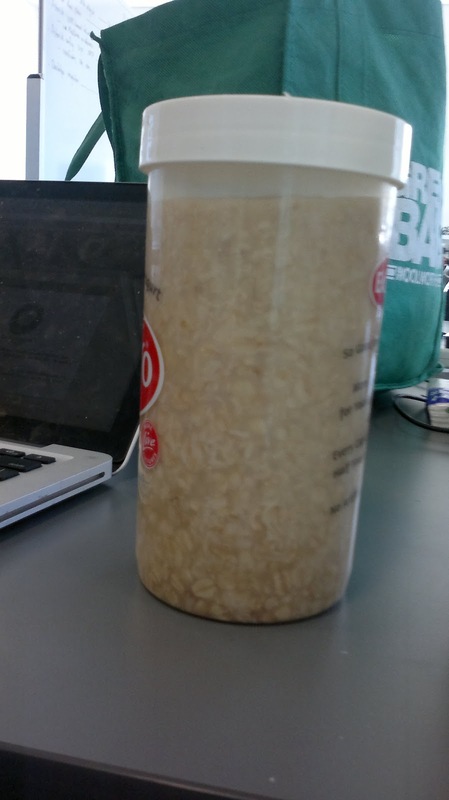 I find that it takes about 20 minutes for the porridge to do its thing and be ready to eat. Riding to work or the beach offers plenty of time. 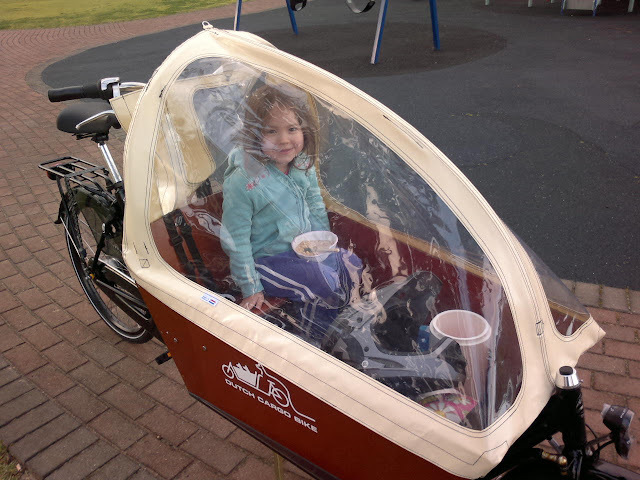 For that matter, getting the kids organised and in the bike after preparing the porridge can take that long. I have left it in for more than an hour without ill effects. However, it must also be said that I am fairly robust when it comes to porridge, and so non-optimal porridge texture doesn't worry me. On extraction, the porridge is ready to eat, yum! Step 3: Hatch it out, stir it, serve it up and eat. You will almost certainly need to stir the porridge to get that nice creamy consistency happening. But apart from that, the porridge is ready and can be eaten straight out of the yoghurt maker if you are lazy. Below are some images of our porridge eating escapades. 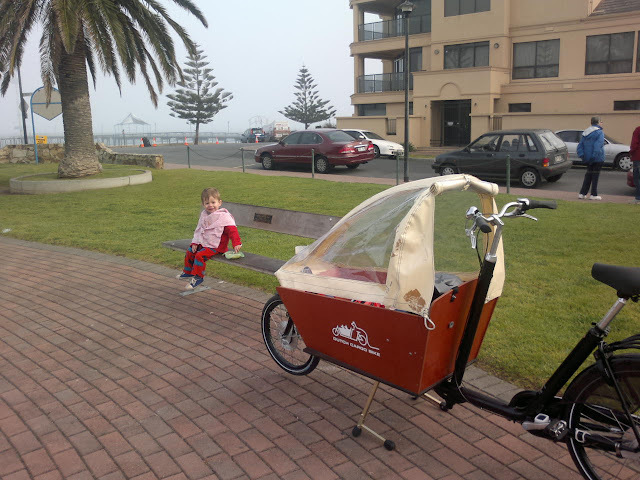 It's an especially nice way to do breakfast at the beach in winter with the kids. 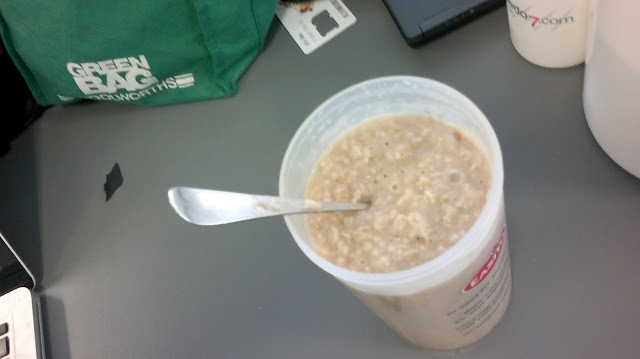 Porridge should always be eaten using old silver cutlery. Fortunately, I keep some of my grand-mothers old silverware at work for this very purpose. Our daughter about to not eat her porridge (we forgot to pack some milk to put in hers) at Brighton Beach. Also at Brighton Beach, our son happily tucking into his porridge. He doesn't care if it doesn't come with milk.